Ford in THE RUSSIANS ARE COMING, THE RUSSIANS ARE COMING. Paul Ford was born on November 2, 1901 in Baltimore, Maryland. Paul Ford passed away on April 12, 1976 in Mineola, Long Island, New York, from heart failure. Ford's success came at age 54, when he played Colonel Hall in The Phil Silvers Show. In 1956 Paul Ford performed in the The Teahouse Of The August Moon which was a stage hit. Paul was nominated for Broadway's 1963 Tony Award as Best Actor (Dramatic) for Never Too Late, a part he recreated in the film version of the same title in 1965. Paul Ford also was involved with a variety of TV shows and voice overs, including: The Red Skelton Hour, The Jackie Gleason Show, Norby, Suspense, Tale Of Tomorrow, Jamie and Journey Back To Oz in 1974 (Voice-over). 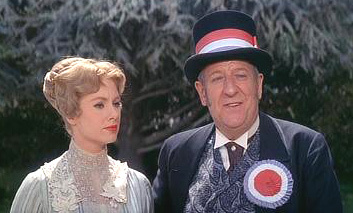 Paul Ford (right) in The Music Man. Ford in The Russians Are Coming, The Russians Are Coming (1966).